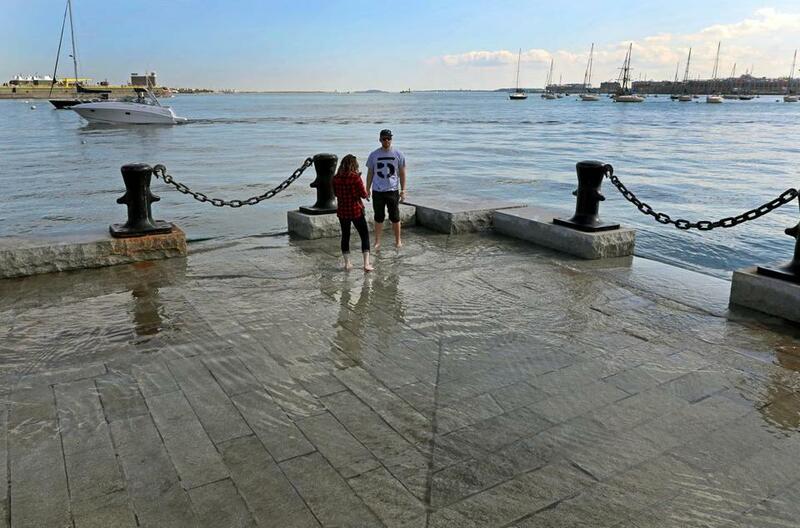 King tides hit the Boston waterfront in October 2016. The Northeast will experience warmer temperatures, higher seas, and greater amounts of rain and snow than federal scientists forecast only three years ago, according to a draft of a major report about climate change awaiting the approval of the Trump administration. The findings were based on an array of new research tools and methods that have sharpened climate scientists’ understanding of how climate change will affect the United States, a greater clarity that one scientist likened to the vast improvement in the images of cellphone cameras over the years. Human activity is the primary reason for many of those changes, which include more powerful storms and the warmest temperatures on the planet in at least 1,500 years, scientists wrote. “Many lines of evidence demonstrate that human activities, especially emissions of greenhouse (heat-trapping) gases, are primarily responsible for recent observed climate changes,” they wrote. If little is done to cut the rise in emissions, average annual temperatures in the Northeast could rise between 5.3 degrees and 9.1 degrees Fahrenheit by 2071, according to the report. That’s nearly a degree higher than the previously forecast minimum rise in temperatures — a significant jump — and higher than the projected average increase for the United States. Over the past century, the region’s average annual temperature increased about 2 degrees, compared to 1.2 degrees for the nation as a whole. Most of that warming has occurred since the late 1970s, according to the report. 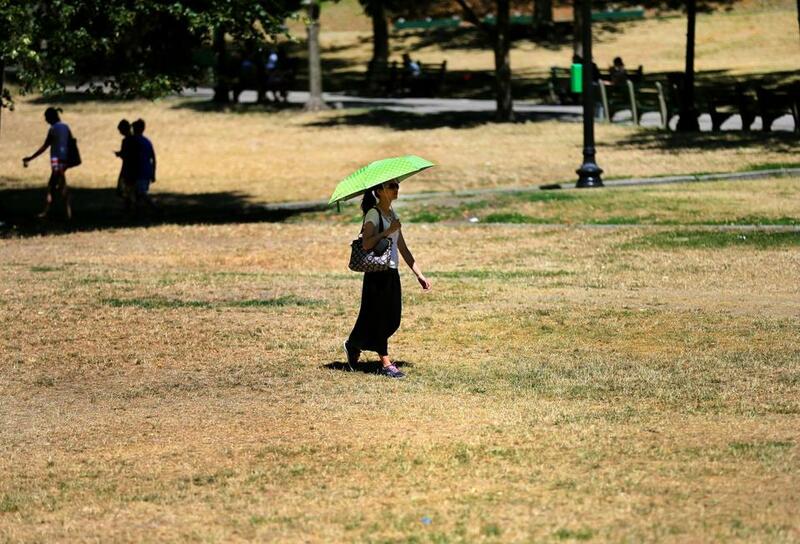 Boston Common looked like a desert during a heat wave in July 2016. Even small changes in temperature can have dire consequences, leading to more prolonged heat waves, intense storms, extinctions of large numbers of species, and the bleaching of coral reefs around the world. Global average sea levels, without significant cuts to emissions, are now projected to rise by as much as 8.2 feet — 1.6 feet more than previously projected, according to the report. As ice melts on the South Pole, the resulting gravitational pull on the ocean, as well as the gradual sinking of land in the Northeast, means that Boston and other New England communities are likely to experience about a 25 percent higher increase in sea levels than other parts of the planet, according to a 2016 study issued by the city of Boston. The report also projects that the Northeast will likely receive a surge in precipitation. In the last federal report, in 2014, scientists found that the region’s precipitation had increased by more than 10 percent over the past century, and the worst storms in the Northeast had brought significantly more rain and snow. In the latest report, the scientists said the most powerful storms are likely to drop even more precipitation. Between 1981 and 2015, the Northeast experienced a 17 percent increase in precipitation from the largest storms, compared with similar storms during the first half of the last century. That was substantially more than any other region in the country. The report serves as a draft of a special science section of the National Climate Assessment, which Congress requires to be published every four years. The New York Times published a story on the report this week. The report’s conclusions are at odds with statements by President Trump and members of his Cabinet, such as Scott Pruitt, administrator of the Environmental Protection Agency, who have raised doubts about the role of human activity in contributing to climate change. Trump has called climate change a hoax, and this spring pulled the United States out of the landmark Paris climate accord. 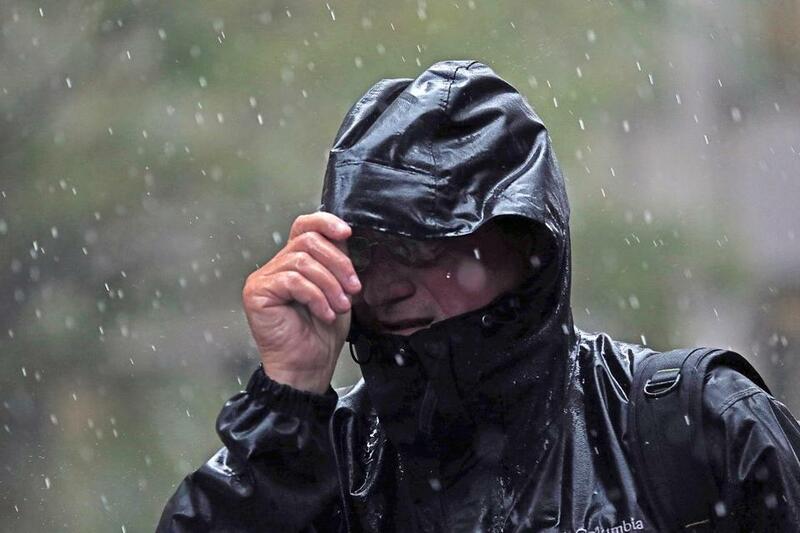 A man pulled down his hood as he walked in Boston during a storm in 2015. At a news conference Wednesday in Boston, Massachusetts Senator Edward J. Markey urged Trump to release the report and warned his administration not to meddle with the science. “We know that global warming is making our planet hotter, but any attempt by the Trump administration to interfere with the science-based assessments would have a chilling effect on scientific research going forward,” Markey said. Raymond S. Bradley, director of Climate System Research Center at the University of Massachusetts Amherst, said the report once again underscores the need for action to reduce emissions. With carbon dioxide levels higher that at any point in at least 3 million years, and rising, and doubt now cast over the efforts to curb emissions signed in Paris in 2015, the planet is heading into uncharted waters, he said. The report is due to be approved this month. 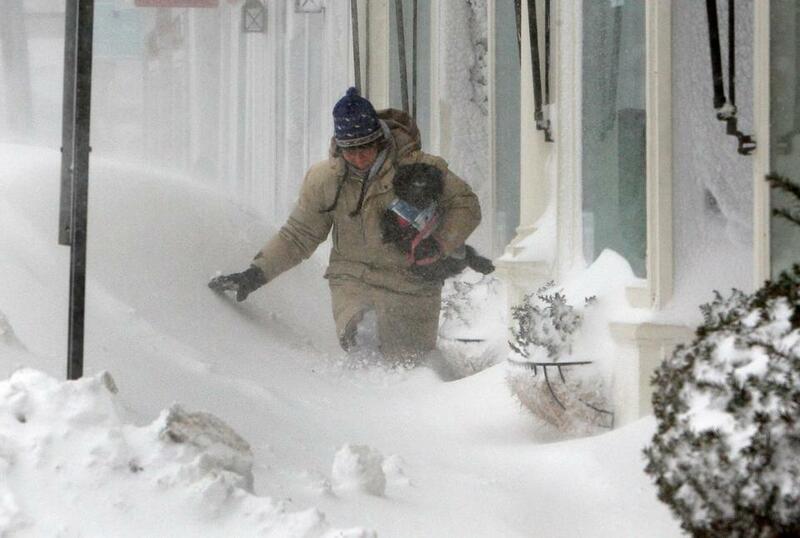 The next National Climate Assessment is scheduled to be released next year. The Times report implied that the document had not been made public, but drafts of the report have been available for months online. “The White House will withhold comment on any draft report before its scheduled release date,” said Sarah Huckabee Sanders, a spokeswoman for the White House. While uncertainties remain, the report finds that it’s now possible to attribute more extreme weather events to climate change, such as major heat waves in Europe in 2003 and in Australia in 2013. Advances in modeling and new observations have also allowed scientists to understand circulation patterns in the atmosphere and oceans better. Elsewhere, the scientists found that temperatures in the Arctic are rising twice as fast as the global average, deepening concerns about the future of Arctic Sea, where ice has been melting at an accelerating rate. The warming in the Arctic has also raised fears that the region’s permafrost, which stores huge amounts of carbon dioxide, could also melt. That could have a huge impact on the planet’s climate.